Looking back on the more recent past is often fraught with problems, especially a tendency to see the world through a prism of stereotypes or rose coloured spectacles. Speaking to the Hebden Bridge Local History Society, Ian Dewhirst, retired reference librarian at Keighley Library, painted a picture of everyday life in Keighley and neighbouring towns with often hilarious detail, but the story was rooted in the rich sources of records and memorabilia found in the archives. Ian is a great story-teller, but he is also a great local historian. So it was that the Hebden Bridge Local History Society was reminded of the bleak facts of life in the back to back streets of towns like Keighley, streets which rarely saw the sunshine. Medical Officers' annual reports record high infant mortality, and diseases like scarlet fever and diphtheria at a time when, to avoid doctors' bills, it seemed that Grandma had a remedy for every ill. Consumption was a killer, and open air sanatoriums were established to cure the illness - an idea turned into a commercial venture when the owners of a maggot farm in Denholme traded on the belief that the atmosphere there was beneficial and opened a 'maggotorium' where sufferers could sleep. Housing conditions caused real problems when there was minimal sanitation for the mass of the town. 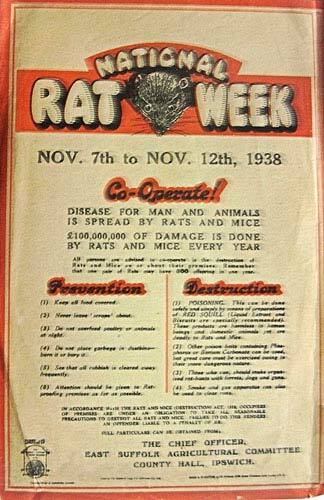 For two weeks every November the public health office promoted a National Rat Week when a penny halfpence would be paid for every rat's tail presented as proof of death. However, slum clearance programmes had started in these interwar years with new council houses built at a density of 12 to an acre, with gardens, toilets and bathrooms, replacing the old back to backs crammed in at 60 or 70 per acre. The brief respite between the two world wars saw huge social changes, with outdoor hobbies like hiking and cycling becoming popular and the break-down of some of the restrictions of relations between the sexes. This was the era of the scouting movement, though it was clear that some of their games were aimed at making the boys into prospective soldiers able to follow commands. The war to come was throwing its shadow over the country from at least 1936, and the horrors and repercussions of the last war were ever present, but there were plenty of opportunities to escape. There were cinemas in every small town, live theatre attracting big names and spectator sports like rugby and football. More people were able to take holidays, and the postcards they sent home are another rich source of social history. Ian's message was clear: hang on to memorabilia - it is through the ephemera of letters, leaflets, posters and club reports that the rich historical details of ordinary people's lives are preserved. At the last in the current series of talks to the Hebden Bridge Local History Society Sheila Graham asks 'Whose land is it anyway?' – a look at the landscape impact of Parliamentary enclosure in this area. Meeting at 7.30 on Wednesday 26th March at Hebden Bridge Methodist Hall.